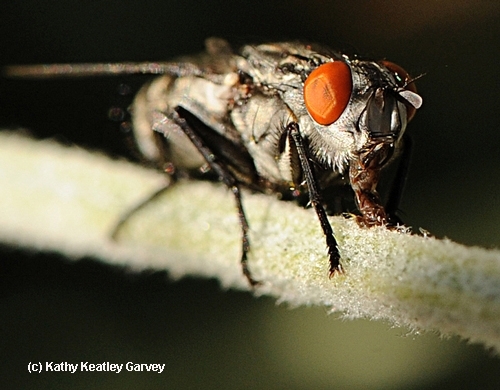 The first thing you notice about the fly is its brilliant red eyes. They stand out like the proverbial elephant in the room. 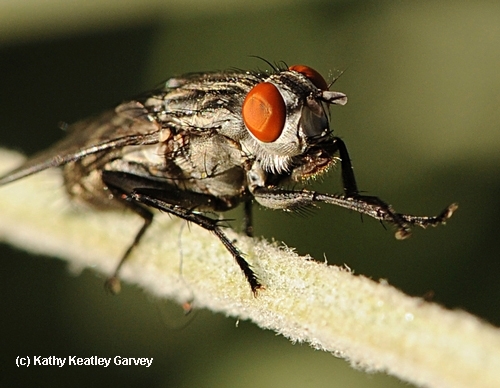 But they are on a fly--a flesh fly. Martin Hauser, an associate insect biosytematist in the Plant Pest Diagnostics Branch, California Department of Food and Agriculture, identified this little critter as a member of the Sarcophagidae family. "Sarco" is Greek for flesh, and "phage" means eating. Hauser, who earned his doctorate in entomology at the University of Illinois at Urbana-Champaign, is skilled at identifying insects. And he speaks German, French and English and studied Latin. The red-eyed fly, which in its larval stage is associated with decaying flesh, sipped a little nectar and then paused momentarily to groom itself. And pose for the camera.